DISCLAIMER: Everything in these posts is based on my own personal opinion. I like and listen to a ton of different groups, so I’m not trying to start fan wars or say X is better than Y. Most of the factors I looked at were highly specific to me and tailored to my tastes. This is not a list of the “best” K-pop releases based on any professional standards; I’m just sharing what I liked and listened to the most in 2017! Also, I’m only covering title tracks for these posts. CRITERIA: I structured the rankings in a similar way to my reviews, so I looked at the whole comeback/debut rather than just the single. However, my feelings about the song carried more weight than those on choreography, music videos, styling, etc. I also considered: Did I really enjoy the song at the time? Did I keep listening to it throughout the year? Was I interested in watching their performances or variety show appearances at the time? Was this a step in the right direction for the group creatively (whether the sales and charts reflected that or not)? So on and so forth. I’d like to say my bias towards certain groups and members didn’t play a part… but that would be fibbing. To be fair, it wasn’t a huge influence; it mostly determined a couple of tiebreakers. Honestly, I debated writing about “Lonely.” I already covered my reaction to Jonghyun’s passing at length, and I’m not quite ready to revisit those feelings – especially given the song’s lyrics and subject matter. On top of that, “Lonely” basically voices thoughts I’ve had in passing during a difficult 2017. That being said, I included it because it’s an excellent ballad that deserves recognition. Jonghyun was a talented songwriter who understood that sometimes all songs need are a moving melody, poignant lyrics, and real emotion in the vocals. “Lonely” is also very special because it’s a duet with his close friend Taeyeon. He thought of her while writing it, and it feels very real and personal as a result (not to mention their voices blend together beautifully). It really pains me that “Lonely” was closer to Jonghyun’s reality than we all knew, but moving forward I will remember it positively as one of the most beautiful ballads I’ve ever heard. GFriend’s first comeback of 2017 came with a drastic – but welcome – image change. “Fingertip” veers away from their usual bright and bubbly fare and brings in some rocking 70’s disco (and some seriously intense electric guitar). Gone are the flouncy pastel dresses and uniformly brown hair colors, replaced by sharp military outfits and shades of blonde and red. And the music video transports to us a neon night time dreamscape – a far cry from the nostalgic classrooms of “Rough” or the sunny flower fields of “Me Gustas Tu.” GFriend has often been pigeonholed as girls who only do the “powerful innocent” concept, but “Fingertip” is conclusive proof that they can (and should) do more. They’ve since returned to music that’s truer to their brand and more attractive to their fans, but I’m happy they managed to break out of the box for “Fingertip.” Here’s hoping they’ll have the opportunity to do so again. If any song could be scribed as a breath of fresh air, it would be “You Are.” GOT7 was once all about catchy dance tracks and extra antics – that’s actually why they were the first group I got into – but this serene single finds them in a much calmer mood. Though that trademark synth carries over from their Flight Log trilogy, this release is much more nuanced and emotional than recent ones like “Hard Carry” and “Never Ever.” While those two songs were quite intense and dramatic (stylistically), “You Are” is light and uplifting. I actually felt my heart swell in my chest when I first heard JB and Youngjae singing the chorus. These days, I see more people complaining about GOT7’s music than I do people liking it. It really saddens me, especially since “You Are” is one of their better songs that have their new defined sound. But as someone who’s enjoyed GOT7’s music through all the eras, I’m delighted they chose to show us a gentler and more mature side. Pristin’s “Wee Woo” is a perfect example of classic bubblegum pop. If I taught a class on K-pop (man that would be so much fun), I’d probably use it as a textbook example of a debut done right. In terms of quality, it checks off all the boxes on the list for success: a catchy and bubbly hook song, an energetic and easy to learn dance, a bright and colorful music video, and visuals for days. It’s also extremely trendy and has on-point fashion and makeup, which is generally pretty beneficial to girl groups. The members of Pristin are effortlessly cool and remind me the popular girls in school: guys want to be with them, and other girls want to be them. Many are already aware of them because of former I.O.I members Nayoung and Kyulkyung, but “Wee Woo” more than proves that we should be keeping an eye on all ten girls. If Pristin is this good at predicting and setting the trends now, imagine where they’ll be in a few years. Over the last five years, BTOB has built up a stellar reputation as a vocal group who excels at sentimental ballads. Funnily enough, they’re also known for being really extra. That seems to describe most boy groups these days, but BTOB still manages to beat them all. While I think “Missing You” was their better release this year, I personally prefer “Movie” because it’s a perfect blend of their music and personalities. The members still show off all of their skills – specifically their amazing vocals – but the smooth and classic sound allows them to go in a more light-hearted direction (think Old Hollywood or Broadway). The best part is definitely the music video, which shows them at their wackiest while parodying famous movie characters like the Joker and James Bond. In a nutshell, “Movie” is just quintessential BTOB. It’s amazing how far Wanna One has come in a few short months. They were all relatively unknown a year ago, but Produce 101 made them so popular that the industry almost doesn’t know how to handle it. Looking at just the songs on their own, I think “Energetic” is stronger and more unique. However, I like “Beautiful” more in terms of the era as a whole. It’s this gorgeous mid-tempo ballad with heart-piercing lyrics about a lost love, complete with a sentimental waltz-inspired choreography and a heartbreaking music video featuring everyone’s favorite friendship Daniel and Sungwoo as long lost brothers. You know that a story is powerful if you can see the gaping plot holes and still cry. Though I think all the boys were skilled enough to debut by Produce 101‘s finale, “Beautiful” proves that they’re not just monster rookies – they have the popularity and the talent to be a considered top tier boy group. By this point, TWICE is basically K-pop’s ambassador of cutesy bubblegum pop. It’s what we love about the girls, and it’s what we’ve come to expect every comeback. All of TWICE’s title tracks highlight their various charms, but “Signal” is the only one so far that has taken things in a more quirky direction. It’s a unique blend of retro and futuristic influences, combining a classic pop melody with what sounds like outer space sound effects in the background. The delightfully peculiar music video continues this interesting contrast: the girls are dressed in funky vintage fashion throwing back to the sixties, but they’re harassing wooing an alien with the powers he accidentally gave them. JYP has a set formula when it comes to TWICE, but it was nice to watch them try something a bit different. 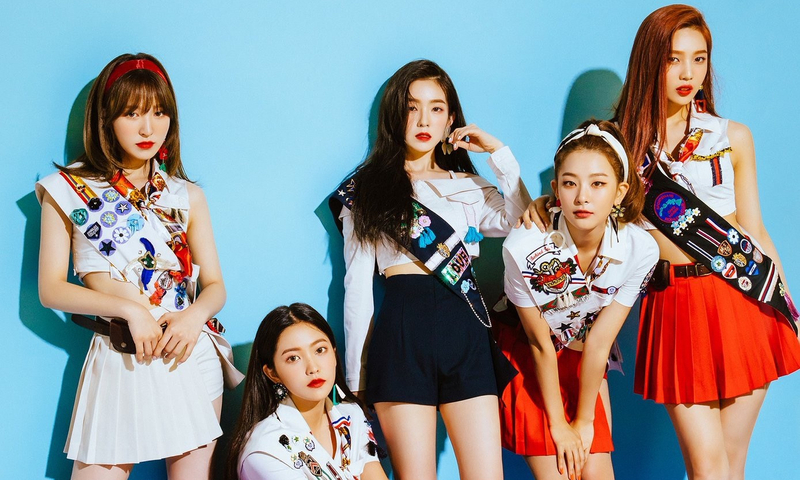 The hook is as catchy as ever and the dance is loaded with an impressive amount of hearts, but “Signal” is anything but mainstream girl group fare. “Holiday” is ultimate feel-good music, from the upbeat tempo and joyful brass to the catchy chorus and power-belting. It’s pretty much impossible to listen to without tapping your foot or singing along. I’ll admit the wholesome PG vibe is a little strange for a group of women in their late twenties… but if you were/are a fan of things like High School Musical, Glee, or anything bright and happy Broadway musical, you will probably love “Holiday” like I do. We all know this year should have been glorious for Girls’ Generation, instead of all the messy stuff that actually happened. “Holiday” is great, but it’s nowhere near the standard of a ten year anniversary song. However, I’m choosing to see it as a ending to their definitive years and the beginning of a new and exciting era. Though I love NCT 127, I’m not into NCT Dream because of the ten year age difference. I have more in common with the teacher the boys are crushing on in the music video (that doesn’t make me feel awkward at all). So it seems strange to rank this song so highly, but I love “My First and Last” because it gives me major nostalgia. While it definitely skews younger, it doesn’t make me feel like a total grandma (*cough* “Chewing Gum” *cough*). It actually has the same fun and wholesome vibe as the music I grew up listening to in the nineties. The lyrics are by far my favorite part; they’re uncannily spot on about the adorably innocent optimism of first love. It’s really easy to get jaded with dating in this day and age, so I get kind of emotional thinking about being young and naive. Sometimes I’d give anything to go back to when I was a ridiculously romantic sixteen year old, fervently hoping I’d only love one person all my life. I usually hate reliving my teenage years, but “My First and Last” brings back fond memories. It may be trendy to be a geek now, but it certainly wasn’t when I was a teenager. Way before I was into K-pop, I was mercilessly teased for liking superhero comics, role-playing video games, and anime. So the little geek girl in me lives for “Power,” because it’s basically a hybrid of all my pop culture tastes. The music video has so many great references, from Star Wars and Tron to some animated scenes reminiscent of Cartoon Network. It’s pretty cool to see my favorite K-pop idols play with superpowers, because it’s like watching worlds collide. “Power” is also a treat because it’s a rare chance to see EXO let loose and have fun. Their image is normally really cool and chic, so I definitely get a kick out of watching them be so goofy as they combat a giant power-stealing robot. There are lots of great little details combined with the members’ personalities, like Xiumin accidentally electrocuting himself and Chen being the strategic one who has to do everything. “Power” is kind of the cheesiest thing ever, but sometimes cheesy is fun.